The Busan Biennale 2010 will be held from 11 September until 20 November at several locations in Busan, including the Busan Museum of Art, as well as at the nearby Yachting Center and Gwangalli Beach, under the theme of ‘Living in Evolution’. The official 2010 Busan Biennale poster, designed by Lee Pooroni and based on the theme ‘Living in Evolution’. We are living individual lives. Yet at the same time, we are living in the processes of evolution. Evolution will continue. But no one knows the direction of this evolution. This exhibition will try to think through the relations between art, society, world, history and the future by considering the dual time axes in which we are living today. Featuring 161 works from 72 artists, the art festival will make a new attempt of integrating three existing exhibitions – “Contemporary Art Exhibition”, “Sea Art Festival” and “Busan Sculpture Project” – into one. The Busan Biennale has been held every two years since the beginning of 2000. This year’s biennale makes an attempt at new discoveries and insights on relations between individuals and mankind, past and future and arts and society. 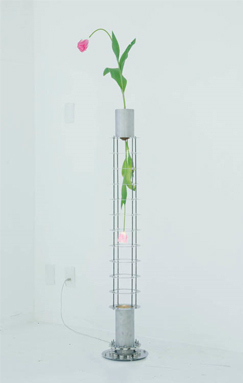 Kiichiro Adachi, 'Antigravity device', 2009, tulip, soil, neodymium magnet, stainless steel, halogen light. In an unusual move, the 2010 Busan Biennale will have one single director, Azumaya Takashi, planning for all exhibitions. As an independent curator hailed for his experimental approach to exhibitions, Azumaya has held curatorial posts at the Setagaya Art Museum and the Mori Art Museum in Tokyo. He was commissioner of the 2002 Media City Seoul and guest curator for the 2008 Busan Biennale. The art festival aims to help forge a closer link between the public and contemporary art through creating connections between the featured works and exhibition venues. Large-scale installations will be placed at several key spots in the city to serve as landmarks, depicting the exhibition theme and symbolising civilisations. Along with the main exhibition, directed by Azumaya, the 2010 Busan Biennale will be composed of special exhibitions such as “Now, Asian Art” and joint exhibitions such as “Gallery Festival” and “Exhibition at alternative spaces”. Featuring young and experimental artists from Korea, China and Japan,”Now, Asian Art” aims to tighten regional networks in Asia and strengthen contemporary Asian art. “Gallery Festival” is a set of special exhibitions presented by local art galleries, again featuring artists from Korea, China and Japan. Educational programs, including a contemporary art course called “Art Story”, will be available. The course is scheduled to open in October and targets adult art lovers and aspiring artists. In addition, a conference of art editors in Asia will be held on September 12 under the title of the “Asian Editors’ Conference”. Donghee Koo, 'Souvenir', 2008, wood, light fixture, mirror, and artificial plant. Thaweesak Srithongdee, 'Zoo', 2009, acrylic on canvas. Steven Pettifor, author of 'Flavours - Thai Contemporary Art'. Thailand has long had a small but very vibrant contemporary art scene. Compared with its recently-flourishing neighbours, however, contemporary Thai art hasn’t been getting much attention. Little has been written about it. Back in 2003, Bangkok based Briton Steven Pettifor decided to address this problem with his book Flavours – Thai Contemporary Art. It’s now been seven years since the book was first published and much of Thailand’s contemporary art scene has changed. Art Radar Asia caught up with Steven Pettifor to find out more about his book, and to see what he thinks of the country’s current art movement. Most importantly, this interview has revealed that there is now more non-Thai Asian art able to be viewed in Thailand. Local art galleries are teaming up with other Asian galleries to bring non-Thai Asian art into Thailand and foreign artists are now viewing Thailand as a place to set up professionally. He also identifies a number of important emerging Thai artists and names some of the top collectors of Thai contemporary art. What prompted you to write Flavours? I’d been writing about Thai art for about seven or eight years. I was starting to build up quite a body of artists that I’ve written about and covered. There was only one other book on Thai art written in English up until that point, and that was Modern Art in Thailand by Dr. Apinan Poshyananda. His book went up to 1992 and then after that it was nothing, and 1992 was the year I arrived in Thailand, so I felt like filling in the gap from that period onwards. That was my intention. I was floating the idea for about a year or two before I actually found someone who wanted to collaborate and publish it, and Thavibu Gallery said yeah okay, we’ll be interested in doing it, we might be able to find someone to back it financially, which they did. They found Liam Ayudhkij, who is the owner of Liam’s Gallery in Pattaya. He’s been collecting art here for thirty, forty years. So Liam kindly backed it. That’s how the book came about. 'Flavours - Thai Contemporary Art', published by Thavibu Gallery. What were the main issues and challenges for you when writing and researching Flavours? I wanted the book to broaden the message about Thai art. I didn’t want to keep the book an academic book, purely for an already art-affiliated readership. I wanted to move beyond that and try and get more general public interest in Thai art. So one point was to keep it accessible in terms of language and to try and cover as broad a scope as possible within a coffee-table sort of format. That was one challenge. Another was to try and cover as many different mediums as possible, so it was finding sculptures, paintings, installations, photography… I tried to cover as many mediums as possible, and that wasn’t easy, given that some of the less popular mediums… it was hard to find good quality artists working in that field. Tell us more about your selection of artists in Flavours. Medium was one big consideration. Also, their career point. I tried to get as many young artists or emerging artists or mid-career artists, so that the book would have relevance ten years on. It’s six years old now and most of the artists are still in their mid-careers. I didn’t want to pick artists that were in their twilight years or have passed away. People ask me why didn’t I include Montien Boonma, who’s considered the father of installation art here. I included him in the overview essay, but because he has passed away, I didn’t want to profile him, because there wasn’t so much currency. His career is not still being carried on, basically. How did your interest in art, and in Thai art, evolve? As early I could remember, I could draw and paint. Not self-taught as such, but it was there from an early age. I don’t come from an artistic family at all, so it was never really nurtured as such. But when I reached high school, I then got pushed toward art, just because they saw my natural talent or whatever. So the interest in art has always been there, but I’d say from high school onwards it was developed by teachers. …It’s not so much as a passion for Thai art. The main art that was in view in Thailand was Thai art, and you just got into it. I got to meet a lot of the artists quite quickly and I found it quite interesting to be thrown in on that level. Back in 1997, there weren’t so many foreigners involved in the art scene and everyone was quite accommodating, inviting you to their studios and things like that. So it was interesting. You got to feel involved. What makes Thai art different from other Asian art? Buddhism is quite predominant here. Sometimes that can be good, sometimes that can kind of almost saturate the art that is produced here. If you look at Burmese art or what’s coming out of places like Laos, you’ll see a lot of Buddhist imagery as well. Places like Indonesia and Vietnam… the art being produced in those places is not so religious-focussed. Religion would be one aspect that defines a lot of the art that is made here. Not necessarily the art that is hitting international levels. They tend to deal with work that is more universal, or themes that would fit more into the international art interest. But across the board, a lot of them deal with Buddhist subject matter. Santi Thongsuk, 'I'm Glad I'm Dead Year', 2000, oil on canvas. Another thing would be the craftsmanship. I do see it elsewhere in Asia, so it’s not necessarily different but there are different kinds of crafts that are brought into Thai art. Chusak Srikwan uses shadow puppetry, but he does things like modern politicians and symbols of corruption. Montri Toemsombat has used silk weaving and silk crafting in the past. There’s this attention to craft. A lot of technical training goes on here, so they get very good grounding in the technical aspects of art training, so that comes through very strongly as well. Chusak Srikwan, 'Birth-Age-Ailment-Death', 2009-10, leather carving. Tell us about the artist training system in Thailand. It’s pretty much similar to anywhere else. It’s art school, mainly. It’s an emerging thing. Art school is expanding constantly and courses are expanding constantly here, but it’s still largely focused in Bangkok and Chiang Mai, with a couple of provincial centers in the north-east and in the south. A lot of young wannabe artists, when they graduate here, will go through assisting a senior artist in a studio for a couple of years. Again, that’s comparable to anywhere else as well. But I find it quite good that artists get a lot of hands on training through working with the artists when they graduate. Is the Thai art scene receiving greater external interest, as compared with before? It was anticipated here around the early 2000s on that there would be a lot more interest on the back of the increased focus towards Asia, with China and India doing very well. Vietnamese art in the mid to late 90s kind of opened up a lot. And it was always expected that there would be more people coming in for Thai art, and for a while there was. There’s a lot more Thai artists now included in biennales and triennales and international thematic shows, but I would say that is comparable to just part of this larger focus on finding art in Asia. I would also say in the last couple of years it has slowed down a lot. Since the coup in 2006, and the financial recession in late 2008, the commercial aspect of art has slowed down quite a bit. But I don’t think it’s just here, I’d say it’s everywhere. Do Thai artists see international acceptance as one of the criteria for success? How does that compare with domestic recognition? There are artists here that are quite content to work on the domestic level, but they have to work within a fairly narrow framework in order to succeed there. And then there are those who desire and need the international exposure in order to continue making art of that kind of calibre. You mentioned in Flavours about a gap between the public and the local art scene, citing insufficient education and exposure as a major problem. Has the situation improved? Things like education are not going to improve overnight. There are more universities and higher education establishments offering art related courses. But for your average state sponsored school, like high school, there’s still going to be a very limited art practice beyond basic drawing techniques and painting. But in terms of accessibility, they are trying to change things. They’ve opened the Bangkok Art and Culture Centre (BACC) here in the last two years, which is a major art center in the heart of downtown. It was always the intention to put it in a very commercial area so that it would be on the consumers’ door step. So they’re hoping to draw in the public to look at art and find out what art is. And there’s another plan to build a national art center in Bangkok. But that’s all very Bangkok-focused. …one way the void is being filled in the provinces is that some of the artists that have either come from different provinces or have gone there to settle or to set up a studio have built artist-gallery-public places – places to promote their own work, but also places to give something back to the community. Up in Chiang Rai, Thawan Duchanee is a good example of an artist that has made his work open to the public. 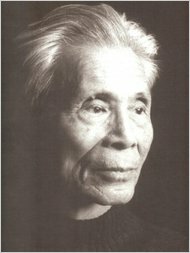 Montien Boonma, 'Drawing of the Mind Training and the Bowls of the Mind', 1992, held in the collection of Chongrux Chantaworasut. How has the local art scene changed since you published Flavours? There are a lot of commercial galleries that have opened up in the last five to ten years, but a lot of them have a less than five-year shelf-life. A lot of galleries are still set up here by people who have an interest in art, but I wouldn’t say that they are specifically trained in how to operate a gallery on a professional level. A lot of them have opened galleries because it’s their passion, but managing it on a professional level doesn’t always work out the way they expect. It’s still tough to make a profit here as a commercial gallery. There’s been a few more non-profit spaces opening as well, but they’re even harder to manage and sustain with no profits coming in and it’s hard to find sponsorship to back spaces like that. One thing that I think is important to push is that there’s been more diversity of art that’s been on view in the last five years or so. When I first started looking at art thirteen years ago here, it was very Thai. Most of the galleries were showing Thai. Any foreign or overseas art would predominantly be at university spaces and would be by visiting lecturers or hookups with overseas institutions. But now, in commercial spaces, more regional art is certainly being seen. Thavibu Gallery bring in Vietnamese and Burmese art. Gallery SoulFlower, which just closed last year, brought in Indian art on a regular basis. Tang have a gallery in Bangkok, and they bring in a lot of good quality, high-profile Chinese art. And there’s a couple of galleries that bring in Japanese artists, and you’ll see Indonesian art here every now and then. So there’s been more exposure to regional and international art. Another development is there’s been more foreign artists coming and spending time here, trying to work out of here. Some just setting up their own studios and still working with their galleries overseas… others coming here to make a goal out of it, trying to get involved with the Thai art scene. If I look at foreign artists based here thirteen years ago, it was more of people using art as hobby rather than a serious pursuit. But now I would say that there’s a lot more foreign artists here that are serious about art making and trying to make a career out of their art here as well. What is the biggest problem facing the Thai art market at the moment? There are probably only around fifty viewing spaces in Bangkok that attempt a regular or an occasional exhibition schedule, but not of huge amount of that translate into sales. I would say only a dozen or so galleries here manage themselves towards a sustainable and professional gallery that also tries to promote its artists beyond Thailand. Can you name some interesting galleries and non-profit spaces for our readers to explore? It’s a bit of a self promoting thing, but I initiated the Bangkok Art Map, which is a useful tool for people arriving in the city wanting to see art, or people living in the city wanting to see what’s happening on a monthly basis. It’s a map of the city’s galleries with the regular exhibition calendar plus highlights of what’s on, and a spotlight focus every month. …obviously I have to say Thavibu Gallery, because they published my book, and I’m working with them this year on a curatorial project for the course of a year called “3D@Thavibu“. That is my conscious effort with the gallery to promote small-scale sculpture in Thailand towards more collecting base and to push emerging sculptors here that don’t get seen in so many galleries here. There’s H Gallery, another professionally-run gallery. It’s run by an American, H. Ernest Lee, and it’s in a beautiful colonial-style building. One of the best galleries running in terms of putting their artists into biennales and working with some of the major Asian and Thai artists is 100 Tonson Gallery. Ardel Gallery is run by a Thai artist called Thavorn Ko-udomvit, who curated the Thai Pavilion for Venice last year. DOB Hualamphong brings in artists that are not necessarily commercially minded. Numthong Gallery has been a gallery that’s done very well over the years. [Mr. Numthong Sae-tang] runs a fairly small space out of a co-op building, but he attracts some of the big name Thai artists to work with him, because he tries to help them out and he’s a very good supporter of the artists when they come on board. Obviously the BACC is a place worthy of visiting. Which artists have been doing interesting things recently in your opinion? There are quite a few artists. The big names are already on the radar. People like Navin Rawanchaikul, Chatchai Puipia, Araya Rasdjarmrearnsook, Sakarin Krue-on… these are all very good established artists. Maitree Siriboon, ''Isarn Boy Dream" series, 2008, photography. On the younger front, I like Maitree Siriboon. He is an artist I think is worth watching. He’s been using photography to photograph himself to examine his identity as an openly gay guy from Isarn. He deals with the rural to urban migration, exploring on a sensory level what it means for him as an artist and as an openly-gay person to move from the provinces to Bangkok. Yuree Kensaku, a Thai-Japanese artist; I like her brand of painting. She’s also doing some sculptural work. I like Yuree’s work a lot. There’s Tawan Wattuya. He does watercolours, very loose watercolour paintings, all about conformity and uniformity in Thai society. He’s done a lot of paintings of groups of Thais in uniforms. There’s a strong sexual element to a lot of his works as well. Also Sudsiri Pui-Ock in Chiang Mai. Yuree Kensaku, 'The Killer from electricity authority', 2009. Are there any major collectors of Thai art? There’s Narong Intanate. He has been collecting more conventional Thai art – modern Thai artists but not necessarily contemporary. But he’s recently started to branch out into contemporary. Disaphol Chansiri has a really interesting collection of Thai and international contemporary art. His collection is open by appointment, he’s housing it in an apartment space that he’s opened up as an art-viewing space on Sukhumvit Road. His collection is very contemporary, probably the most contemporary I’ve seen in terms of the artists he’s collecting. Jean Michel Beurdeley is a French collector who has lived here for decades. He has a collection that he opens up in quite a nice traditional Thai house where he lives. Again, viewable by appointment only. One more worth mentioning is Petch Osathanugrah. He’s collected contemporary domestic art. I don’t think his collection is housed in any permanent space at the moment. For awhile he was going to open a private museum, but I don’t think that has materialised. Are there any books or websites you would recommend for learning more about Thai contemporary art? I would say our website, the Bangkok Art Map, would be a site to mention. The Rama IX Foundation is very well supported. Until recently, they’ve focused more on senior conventional artists. I think there’s more diversity to their website, but there’s a lot of contemporary artists not on there. But it’s a good website. Several of the gallery websites have good listing info. As I said before, there are only two books out there, Modern Art in Thailand and Flavours. They’re the only two English-language books that have been written on Thai art in the last fifteen years. Born in 1968 in London, Steven Pettifor graduated with degrees in fine arts from both the Wimbledon School of Art and Liverpool Polytechnic. The writer-artist-curator has been living in Thailand since 1992, immersing himself in the local contemporary art scene. He is currently the Thailand Editor for Asian Art News and World Sculpture News. Modern Chinese master painter Wu Guanzhong passed away in late June this year, aged 91. Wu became known for using traditional Chinese ink brush techniques to produce an aesthetic that is distinctly influenced by western art, in both ink and oil mediums. In his last years, Wu donated many of his works to public museums. Wu Guanzhong, 'The Call of the Gods', 2009, oil on canvas. According to The New York Times, Wu gave 113 works to the Singapore Art Museum in a donation valued at 73.7 million Singapore dollars, about $53 million in 2008. He also donated dozens of paintings to the Hong Kong Museum of Art, adding to a collection of previous gifts. Just before his death, he donated five more of his works to this museum. In the summer of 1950, soon after Mao Zedong had proclaimed the founding of the People’s Republic, Wu Guanzhong, happily studying painting in Paris, made the fateful decision to return to China. Appointed to teach in the Central Academy of Art in Beijing, his head full of Cézanne and Van Gogh, he soon found that he was forbidden to mention those names, and felt unable to face his radical students until he could talk about socialist realism in the Soviet Union, and its foreshadowing in the art of Ilya Repin. This was the beginning of almost three decades of harassment and victimization that, for him and countless others, ended only after the death of Mao in 1976. Wu Guanzhong was born in 1919 into a peasant farm family in a village near Yixing, in east China’s Jiangsu province. In his teens, he was studying to become an electrical engineer, but Wu changed his path after attending an art exhibition at the National Arts Academy of Hangzhou. He decided to transfer to this institution to study and it was here that his talent started to blossom. After studying both Chinese and Western painting under Lin Fengmian and Pan Tianshou, Wu graduated from the National Arts Academy of Hangzhou in 1942. After teaching art in the architecture department of National Chongqing University, he won a scholarship to study at the École Nationale Supérieure des Beaux-Arts in Paris. He left China in in 1947. Here, Wu studied under Professor Jean Souverbie, whom according to Wu had affected him deeply. But by 1950, he began to feel cut off from his roots and decided then to go back to China. The three-year study in France enabled Wu to capture the essence of modern art in the West. Growing up in withinChinese culture, he also had a deep understanding of Chinese painting style. After his return to China, Wu taught at the Central Academy of Fine Arts in Beijing and other institutions. He introduced Western art to his students, but the Academy was dominated by Soviet social realism and he was branded as “a fortress of bourgeois formalism.” Refusing to conform to political dogma, he was transferred from one academy to another, painting in his own style. During the Cultural Revolution in August 1966, he was forbidden to teach, write or paint. Eventually he was sent to the country to work as a farm labourer. It was only after two years that he was permitted to paint again. Gradually, things got better. In 1973 Wu was one of the leading artists brought back from the countryside, an initiative of Zhou Enlai, the first Premier of the People’s Republic of China. He was painting again, travelling around China and writing articles. His rehabilitation was marked by an exhibition of his work in 1978 at the Central Academy. From that moment, he never looked back. Major exhibitions of his work were held in the British Museum in 1988, in the US in 1988-89, in Tokyo, Hong Kong and Singapore, and today he is recognised around the world as one of the masters of modern Chinese painting. 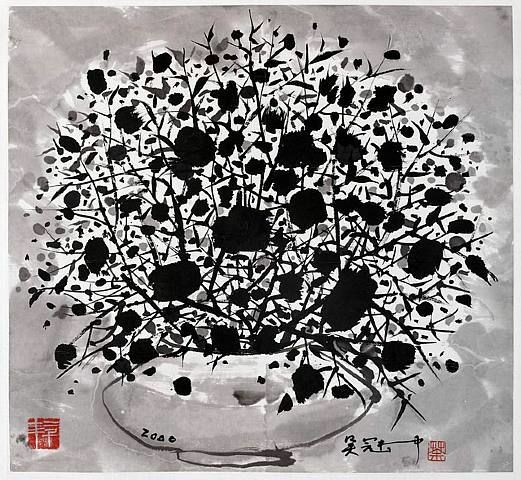 Wu Guanzhong, 'Flower', 2000, ink on paper. Like Van Gogh he painted not just the form, but “with his feelings”. He found inspirations in the beauty of nature. Wu’s style of painting has the colour sense and formal principles of Western paintings, but tonal variations of ink that are typically Chinese. In his work, natural scenery is reduced to its essentials – simple but powerful abstract forms. In rows of houses built along the contour of the hills, Wu discovered abstract patterns, the white houses with black roofs standing out against the soft grey tones of the mountains or water. In all his work, objective representation loses its importance, overtaken by the beauty of the abstract forms, lines, colours and subtle ink tones. Wu’s works are unconventional and full of passion. In the eyes of the West, the images are very Chinese, but to Chinese viewers, the images appear modern and Western. In a recent Philippine Star article, Clarissa Chikiamco, a Manila-based art writer and independent curator, discussed the current difficult funding situation affecting Filipino independent art spaces, which parallels similar issues that arose in the Philippines fifty years ago. Squeezed between “commercial gallery apparatus” and the “supposed behemoths of institutions”, independent art spaces, also called “artists-run or alternative”, are crucial for contemporary art as they “provide a more accessible environment ripe of the speculative”. However, as Chikiamco points out, three areas contribute to the inevitable fate of closure for independent art spaces. First, lack of stable funding means that day-to-day expenses for these spaces are the most difficult to find. Operational costs are the basic necessities which funding institutions nearly always shy away from, preferring instead to back output-type undertakings such as events or publications. Without stable funding time tick-tocks on the expiration date of these spaces, just like the legendary Philippine Art Gallery 50 years ago, need money ‘to pay for the light’. The schism between the NCCA and the community seems to have gotten wider in recent years, the government having an increasingly notorious reputation as a consistently unreliable source of support for the arts. Support in tangible materials is obviously in short supply but it goes beyond that to demonstrate a demoralizing lack of appreciation and understanding of the government of its country’s art scene. Bea Camacho’s eleven-hour performance at the Turbine Hall, part of Green Papaya Art Projects’ program for “No Soul for Sale". Image courtesy of Green Papaya Art Projects. Third, Chikiamco states that private support, as a strong alternative to government funding in countries where the latter is declining, cannot be depended on in the Philippines. The few businesses that support the arts are more concerned with name branding; company-sponsored art competitions are the major form of participation these businesses take. She then explores ways to improve the Philippine art funding challenge. There is a need to channel funds and good intentions for the arts to meet the basic needs of the art scene. A spirit of philanthropy is needed, while the sponsorship practice must be professionally branded so that corporations are properly recognised. Private support can come in many forms: bequests given to museums, travel grants, residencies for local artists to exhibit abroad, or simply covering the overhead expenses for independent art spaces. Grounded in concrete resources and a healthy sense of reality, an art scene can — and will — only progress as far as our vision can take us. Founded in 2000 by Norberto Roldan and Donna Miranda, Green Papaya Art Projects is the longest running independently run creative multidisciplinary platform in the Philippines. Its mission is to support and organise actions and propositions that explore tactical approaches to the production, dissemination, research and presentation of contemporary practices in varied artistic fields. It was the only Filipino group invited to “No Soul for Sale“ in 2010, billed by The New York Times as “the Olympics of nonprofit groups”. Aiming to be at the forefront of Filipino contemporary art, mag:net has been a café, magazine/book/music/film store, exhibition space and a performance hub for many emerging local artists since the early 2000s. mag:net has eleven offshoots in Manila today, hosting exhibitions, film screenings, music and poetry readings and artist talks. mag:net GALLERY's weekly updated schedule of events. Courtesy Mag:net Gallery. Over the years, their nicely run café business enables the gallery to stay independent and sustainable. Along with their carefully curated weekly changing events, this explains mag:net GALLERY’s successful management compared to other artist run spaces in the Phillipines and elsewhere. Jucar Raquepo's 'Terror East', part of a current exhibition at mag:net GALLERY. Image courtesy of mag:net GALLERY. Established in 2006 in Manila, Silverlens Foundation is a grant-awarding body for photography artists. It provides professional and financial support for these artists through completion, acquisition, and exhibition. The Foundation is currently establishing a lending collection of contemporary photography and reference library relevant to the Philippines. It also regularly organises art talks, film screenings, lectures and slide shows. The two pioneering artist run independent spaces in the Philippines were Surrounded by Water and Big Sky Mind, founded in 1998 and 1999 respectively by Wire Tuazon and Ringo Bunoan. They both formed a close-knit artists’ community and invited their artist friends to exhibit and congregate. The goal of these spaces was to promote contemporary art by engaging in dialogues, encouraging innovation and diversity in art and supporting young and less established artists. Artists who passed through these two doors often became noteworthy characters in the Manila art scene. Both spaces are defunct now, as both artists’ agenda deviated after they moved into the “mainstream”. Bunoan works with Asia Art Archive while still working on her art. Tuazon is working on his paintings for important art centres in Asia, organising festivals, and curating exhibits. Contrasts Gallery Shanghai was the host of the recent exhibition “Mind Space: Maximalism in Contrasts” curated by distinguished art scholar and curator Gao Minglu. While visually the works in the exhibition referenced Western modern or conceptual art, the philosophical underpinnings were quite different. Artists Zhu Jinshi, Zhang Yu, Lei Hong and He Xiangyu participated in the show. All works in the exhibition where chosen because they fall under the term “maximalism”, a term used by Gao Minglu when discussing the philosophical core of Chinese abstract art. Gao characterises the art in “Mind Space: Maximalism in Contrasts” as being “incomplete and fragmented records of daily meditation.” According to the him, they are like a diary or running account showing the daily workings and activities of the artist, be they trivial or not, rather than a complete work of art. In this way, they present some similarities with Western postmodernist deconstruction. Zhu Jinshi, Hui Neng's Work, 2010, ink on rice paper, 2000 x 72 x 130 cm. Generally, the work of artists in the maximalism tradition is less popular or has largely been ignored. According to Gao, this is partly because of its lack of political subject matter and partly because of its literati aesthetics. Literati painters were Chinese scholar-officials who were not concerned with technical skill and commonly created black ink paintings. The style of the brushstroke was said to reveal something about the inner life of the artist. Zhu Jinshi (b. Beijing, 1954) is one of China’s leading avant-garde artists and was a member of the now legendary Stars Group, an artist collective active between 1979 and 1983. Zhu has dedicated the bulk of his career both in China and Germany to the exploration of abstract art and installation work. His medium of choice is Chinese rice paper and ink which he also uses in the exhibited installation, Soaking. Here he fills a metal container with ink and places a pile of rice paper partly immersed in this ink. The half of the paper that is outside the ink gradually changes colour without intervention from human hands. It is a work in progress and uses rice paper and ink; these literati characteristics put the work squarely within the maximalist tradition. Zhu Jinshi, Soaking, 2008, 170 x 100 x 50 cm. Zhang Yu, Fingerprint 2004.10-1, ink on rice paper, 200 × 260 cm. For The Coca-Cola Project, young artist He Xiangyu (b. Dan Dong, 1986) cooked tens of thousands of litres of Coke which crystalized the dark liquid. He then made ink out of the created substance and used this “ink” to create his paintings and for writing calligraphy. Lei Hong’s (b. Sichuan Province, 1972) work has the characteristic marks of Western abstract art – with its myriads of dots, lines and squares – but conceptually his motives are quite different. According to the artist, these marks are not born out of artistic concepts but rather out of imagery, akin to traditional Chinese ink painting. The curator of the exhibition, Gao Minglu. Gao Minglu, is an author, critic, curator, and scholar of contemporary Chinese art. He currently serves as Head of the Fine Arts Department at the Sichuan Academy of Fine Arts and is a Research Professor in the Department of History of Art and Architecture at the University of Pittsburgh. He has curated many exhibitions in the U.S. and China including the “China/Avant-Garde” exhibition (1989), “Inside Out: New Chinese Art”(1998), “The Wall: Reshaping Contemporary Chinese Art” (2005), “Apartment Art in China, 1970s-1990s” and “Yi School: Thirty Years of Chinese Abstraction” (2008). An art research center in Beijing is named after him, the mandate of which is to work as an alternative research space into contemporary art in China that is neither involved with the government nor with commercial art galleries. Contrasts Gallery is a Shanghai based gallery which was founded by Pearl Lam in Hong Kong in 1992. The focus of the gallery is to promote cultural dialogue and exchange between the East and West, not only in art but also in design and architecture. “Structures Within an Intervention“, a show that was on at The Guild Art Gallery, New York, was centered on the various relationships that exist in the art world. Relationships that determine the place of an artist, curator, dealer, buyer, critic and the spectator in relationship with each other under the institutional umbrella of a gallery space, function as the central premise for an interventionist re-thinking of the lines between artist, curator and spectator. The show consisted of five “interventions“, scheduled at specific times, which were open for anyone to witness. With each intervention, the meaning of the work and the artist’s intention were reworked into a new context. Participating artists and artist collaborators included Afruz Amighi, Anindita Dutta, Divya Mehra, Fawad Khan, Mariam Ghani, Michael Buhler Rose, Nidhi Jalan, Rajkamal Kahlon, artist project Redo Pakistan (Fatima Hussain and Hamja Ahsan), Swati Khurana and Vandana Jain. Art Radar Asia spoke with Meenakshi Thirukode, curator of “Structures Within an Intervention”, about the show and the various issues that have arisen within and from the interventions. How did “Structures Within an Intervention” come about? All of my curatorial projects are essentially dialogs – a continuation of dialog to be precise. For me curating is one form of trying to find answers or just have a conversation or perhaps even find some kind of reconciliation between the idea of the institution and the idea of the individual. So, when The Guild Art Gallery asked me to curate a project for them, one of these dialogs manifested as “Structures Within An Intervention.” I don’t work from the standpoint of thematic contexts. I think that’s a regressive way of contextualizing any practice. There has to be some kind of deeper more genuine search.To go beyond expectations, categories, niches: it’s the need to have that conversation and have it materialize as projects that are physical or ephemeral, definite or indefinite that is my focus. “Structures Within an Intervention” features contemporary artists of Asian origin and a few of these artists straddle multiple media and follow specific ideologies. How did you select artists and works for this show? The premise was already laid out for me by the institution. As The Guild gallery focuses on South Asian and Middle Eastern artists, I had to function within those parameters, so to speak. This was a perfect scenario because it is in a sense reflective of how contexts are created based on this very focused mission of commercial institutions. In a way, this is the gallery’s identity, one that it has every right to define just as artists or even curators define their own (by choice or by contexts others build around him/her). So how do all of these structures work then? What do we have to say beyond this obvious friction between institution and individual and all of the hierarchies within it? That is something we are trying to get at here. I chose artists that I’ve been working with since I started to “function” in the art world as a writer and curator. I’ve written about their work or curated them in other projects. I’ve done so because I connect to their work and to me it’s important to nurture that relationship, to see the work progress, evolve, change or perhaps remain as is. Whatever the case might be my relationship to all these artists is important in terms of my curatorial practice and what my work is about – some I’ve known since the start of my career and others I am getting to know along the years. This continuity is pertinent to my work and given the premise under which I was asked to curate the show, it was a perfect segue into exploring all the intricacies and structures so to speak between artist, curator, gallery, collective and all the other myriad categories under which we all function in the art world. The works were chosen predominantly by talking to the artist about this premise and seeing what they thought would work best. In that way, I was playing with the idea of authority and control – is it the curator who has the control and so called authority to choose the work or did it transfer to the artist? Or did I, as curator, allow the transfer of authority to artist in choosing the work they wanted to be a part of the project. Of course less romanticized factors like availability of the work also played a role in what work was ultimately part of the show. It seems the interventions essentially seek to question some defined norms of social relations, personal and public, and institutional hierarchies under the umbrella of which we all seem to operate. Do these interventions manifest themselves via the work/the artist/the curator, or via the interaction of all of them? How, then, is it a move away from or within the defined systems of collectives/curatorial practice/artist as the creator of meaning? Freedom is an interesting word. Because we presume we have freedom but most likely we don’t. From the start of the project, the way it culminated, the responses of artists and those invited to intervene, all of it embodied this notion of freedom and control and who was giving it and how much of it. Five interventions were set to take place and four of the interveners were artists whose practice extends beyond just their ‘individual’ practice to put it in simple terms. Parlour is a curatorial duo (Leslie Rosa-Stumpf and Ciara Gilmartin) and has proposed an intervention that will re-curate the exhibition in an attempt to bring the participating artists’ practices into a broader contemporary dialogue—not one tied to a definitive cultural milieu. New artists will be invited to be part of the conversation. Parlour alone functions predominantly as a curatorial duo but since their intervention is still to take place the context of their interaction is ambiguous. Town Hall Meeting (THM) describe themselves as performative art historians, AD HOC VOX‘s (AHV) Colleen Asper and Jennifer Dudley are artists but as AHV they are having their own critical dialogs about varied ideas both within and outside of what we call contemporary art. SHIFTER is a publication Sreshta Premnath co-founded with another artist. Greshams Ghost is Ajay Kurian, an artist who functions within the norms of a curator under this insignia. Interestingly the four interventions that have taken place have all been more of a performance or what would seem like an artist’s intervention rather than a curatorial intervention. Of Course Parlour’s intervention is yet to take place so we would have to wait to see what they do. There was no sense of inclusion/exclusion or a presence of authority and control as would define a ‘curator’. If work was being placed as in the case of AHV and Greshams Ghost, I did not tell them where to place it. They chose where to place the works. There was no attempt to move away from anything really because I don’t think exact defined roles exist in what we all do. How do we define performance even? During AHV’s intervention Swati Khurana, an artist in the show, did a performance with her grandmother called Lesson 1, which involved them knitting a ball of red yarn together concurrent to a reading that Colleen and Jennifer performed after installing their artwork in specific sites around the gallery space. We then celebrated her grandmom’s 80th birthday with a surprise birthday cake – is that performance? Did I, by suggesting we get cake, lead everyone into a performance no one knew they were participating in? Is that curatorial control then? For instance, I have a blueprint on the wall where I’ve been documenting whatever has been placed or left behind or performed in the gallery space. It is a blueprint/a record in flux. In a way I am trying to exude control but do I have any? And by virtue of placing this blueprint on a wall am I functioning as an artist? Or am I strictly a curator? Are the interveners artists or curators or critics? Are they institutions since they have built an identity and a ‘brand’ with logos and mission statements separate from who they are as artists or writers? In fact, I have a logo and have created this pseudo institution of myself called MT Productions. So what does that make me? All those definitions and roles then seem redundant and I am just trying to see if that’s a justifiable statement through this project. There are set dates and times for these interventions. Do these interventions, in themselves, become performative? Is the essential quality of the show dependent upon viewers witnessing these interventions? If yes, how so? Viewer interaction was very key in all the interventions. With Town Hall Meeting and SHIFTER they were participants rather than mere ‘viewers’. While with AHV and Greshams Ghost it was more of an opening reception/reading/panel discussion kind of interaction. Town Hall Meeting had prepared a questionnaire based on their reading of postcolonial theorists as well as essays and texts on the notion of the ‘other’. So the participant would sit with them, in a make shift tent they made in the gallery, thereby making it a small more comforting space within the abstract gallery space, and answer the questions. THM is in the process of compiling the answers. Shifter’s intervention involved looking at works with torchlights while Trin T Minh-ha‘s lecture played. So the role of this ‘viewer’ has also been a point of exploration within established structures. Many Asian artists, increasingly because of international gallery representations and greater exposure to international markets, fairs and increased interest in Asian art, have attained a global status. Their works are international in spirit but often deal with themes of displacement, identity and are culturally specific. Additionally, most artists featured in this show are international artists of Asian origin. How do these themes appear in this show? In the interventions so far, how have the artists responded to re-contextualizing their works? The artists were chosen either because they were of South Asian or Middle-Eastern origin or had some connection to the region as embodied in their practice. This was a conscious choice reaffirmed to work within the gallery’s vision as well so as to have that ever-present dialog and debate of choosing artists and creating contexts based on nationality. The process of inviting artists was interesting. So was the process of inviting those who would function as interventions. Most accepted to be a part of the show as artists while some had issues with being contextualized based on their South Asian identity, even though the point of the project was to set it up that way so that we could deal with all the problems associated with it. And that was great! It shows how some artists can be very cautious of how their work is being contextualized. It shows a need for control, perhaps. And so even before the project materialized here we were negotiating control! Here was a strain of dialog that’s always running through every other debate on the ‘other’ identity, the ‘non-Western’ identity, that was more pronounced now that we were specifically talking about a project that was ironically trying to discuss the problems of such contexts and if at all it can be resolved here. In terms of responding to the actual interventions it’s always been positive and interesting when they give their feedback. They have been more open to all these different interactions and contexts. No sense of losing control even though it could have run through their mind at some point, I suppose. I can’t speak for them but it also brings up the notion of trust in my mind. The fact that I know most of them at a personal level, if not all, it’s less formal, so to speak. I mean of course there are consignment agreements and everything else related to formal structures between gallery and artists but there is still a sense of community here between all participants. Do you plan a finale for the last day of the show? There’s no finale. The project in its materialization at The Guild ceases to exist. The dialog still goes on. Meenakshi Thirukode is a writer and curator based in New York. She graduated with honors for art critical and historical development from the masters program at Christie’s Education, New York. She has written for leading Indian newspaper The Hindu, and is a columnist for White Wall Magazine‘s online daily as well as artconcerns.com. Thirukode serves on the Christie’s Alumni Society Board (New York). 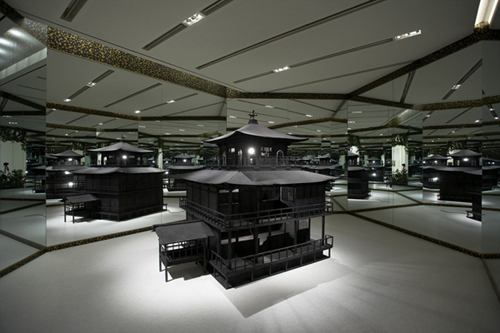 The Taipei Fine Arts Museum (TFAM) in Taipei, Taiwan is currently exhibiting the works of Taiwanese artist Tsong Pu. The exhibition, entitled “Art from the Underground: Tsong Pu Solo Exhibition“, displays over 100 works representative of Tsong Pu’s thirty year career, ranging from his earliest works from the 1970’s to his more recent installation pieces, drawings and paintings. It comes amid rumblings from the art community that the Taipei Fine Arts Museum is failing to represent local artists. “My first exhibit was held in this space 20 years ago. It seems that I haven’t improved much over that time because 20 years later I’m still … underground.” Tsong Pu, as quoted in the Taipei Times. Tsong Pu was born in Shanghai (China) in 1947. He attended Fu-Shing Commerce and Industry High School in Taipei, Taiwan, and went on to study at Las Escuela Superior de Bellas Artes de San Fernando de Madrio, Spain. He professes to choosing a school where he would be forced to draw realistically, a style that is in direct contrast with the abstract work he has created since leaving Spain and returning to Taiwan in 1981. Tsong Pu has had a keen interest in European and American abstract expressionism since he was quite young. His early influences included Western art magazines from Japan and the US; the knowledge he took from these separated him from his peers. He has held numerous solo exhibitions since 1983 in Spain and in Taiwan, as well as participated in domestic and international group exhibitions all over Asia, in Spain, the US, the UK, and Australia. Tsong Pu is most well known for a painting style he developed during the 1980s, in which he paints an abstract pattern based on a grid, occasionally with diagonal lines of white. This is a method often praised by art critics as it has the ability to promote an emotional response while being thoroughly mechanical. Tsong Pu is often viewed as one of the most progressive artists working in Taiwan today. His 1983 solo exhibition, “A Meeting of Mind and Material”, broke with established rules of painting, the result of his desire to abstain from simply drawing realistically and seeking new ways to present his ideas. He has been praised for his ability to embrace new concepts and new media, as he composes his paintings using inspiration from his everyday surroundings. We have since published a three-part interview in which Tsong Pu discusses six of his artworks in depth. This is framed by some discussion of the Taiwanese contemporary art community, past and present.